A young Vietnamese-American, eager to serve his adoptive country and use his unexpected powers coupled with his mastery of Viet martial arts to fight crime! And stuff. 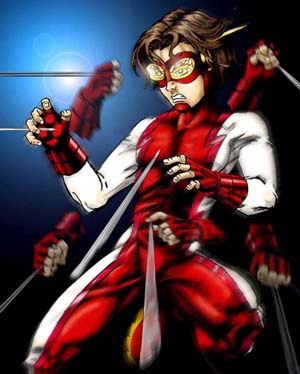 When Turbofist's cousin was snatched from a nightclub, possibly by the serial killer stalking Millennium City and committing vaguely mystical murders upon the victims, the fiery young would-be hero leaped into action! Streaking down to the club in question, ready for bear in the new costume his father bought for him, he leapt headlong into a superbattle, taking a wild swing at the veteran Rook who had just KO'd Blackjack. Not sure what was going on but not one to let that stop him, TF was nevertheless quickly subdued by the steely-nerved Human Fortress. In the aftermath the details of the set to were sorted out, and Turbofist impetuously insisted on chipping in on the Mill-men's efforts to locate the mystical serial killer, and thus was sucked into the Chantal misadventure. Along the way, the act-first, think-last wet-behind-the-ears rookie started to learn some hard lessons on how to be a hero, but despite some unfortunate turns of events Turbofist never balked or hesitated to join a fray or pitch himself into the breach. Turbofist is a mutant with the ability to vibrate every molecule of his body at hyper-speed. This gives him a modest variety of abilities ranging from running fast, to vibrating his molecules so fast he can pass thru solid objects, to vibrating so fast he agitates the air around him, forming a bullet-proof aura. Turbofist backs up his modest superhuman power with a thorough mastery of the Vietnamese Martial Art Vovinam Viet Vo Dao; he is also able to combine his fighting style with his vibratory ability to deliver incredible punishing HtH blows.